Wax Refills include: 24oz of richly colored American Soybean WaxTM in a microwavable container and 1 package of 5 wicks in your choice of burning diameter. Choose wick size based on the diameter of the containers you wish to fill. For example: If you are going to fill a votive size cup, you will want to use the RD29 Votive Wicks. This kit will refill 9-10 votive glasses. Please remember to only refill your votive glasses 1-2 times, however, as the glasses will weaken over time. For Bird Pottery use 2 of the #51 wick. For square and round pottery containers use a #62 wick. For Square Skillet candle use 4 #51 wicks. For Round Skillet use 3 #51 wicks. For 12oz. and 24oz. jar candles use the #62 wick. 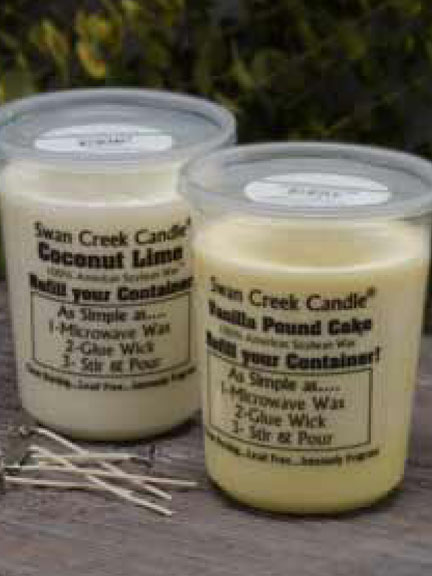 If you want to use more than one wick per candle, always choose a smaller wick size.